Benson Energy has noticed increasing numbers of home invasions via the chimneys of wood burning masonry fireplaces. Rescue 911, Incident Episode 512 - "Chimney Trapped Crook"
We want to again state our company policy of providing, free of charge, an All Season Chimney Cover for any homeowner that has been the victim of a home invasion by a stalker or a burglar gaining access to the home through the chimney top. All that is necessary is to supply proof of the the problem. Such proof will consist of copies of police reports, media reporting of incidents, etc. Other conditions may apply as well. Other types of home invasions by birds, animals or insects will receive individual consideration. No policy concerning invasion by remote controlled devices, such as drones, autonomous flying robots, etc.,has been set, but will be when such incidences have occurred. If you have been the victim of chimney invasion, click here to apply for assistance. Date Published: Feb 03 2014 by Bonnie Bradshaw of 911 Wildlife An amazing number of wild animals thrive in the city and raise their families in close proximity to humans. When warm weather arrives, furred and feathered babies begin arriving on every block in the neighborhood. If the nest is in a tree, that’s wonderful, but if the nest is in your attic or chimney, it can feel like your home has been invaded by little monsters. This small bird has shiny black iridescent feathers with white flecks. The Acclimation Society of North America in 1890 released 60 European starlings in Central Park to allow New Yorkers the opportunity to see all the birds mentioned in Shakespeare’s plays. Another 60 starlings were released the next year. Scientists estimate that descendants of those 120 starlings now number more than 200 million in the United States and every year cause millions of dollars in damage to homes, commercial buildings and agricultural crops. Starlings build their nests in cavities such as dryer, plumbing, kitchen, bathroom and attic vents. To prevent these feathered foes from invading your home, it’s important to cover all vents with heavy gauge, galvanized half-inch by half-inch wire mesh. Don’t skimp and buy one-inch by one-inch wire mesh – starlings easily will fit through that size mesh. Overhanging tree branches provide a welcome mat for squirrels to access your roof. Once there, they look for loose shingles, rotten wood, warped siding and other vulnerable spots that allow them easy entry into the attic. Squirrels give birth to two litters per year – one in early spring and the second in early fall. Tree cavities and attic den sites are aggressively sought in early spring when temperatures are cool. For the second litter, squirrels are more likely to build a leafy nest high in a tree. Cutting back tree branches and performing routine home maintenance are the two most effective ways to prevent squirrels from giving birth in your attic. Raccoons are well acclimated to residential areas and sometimes occupy those areas in larger numbers than rural areas. This is due to the fact that raccoons find more food in city and, as a result, produce larger litters. 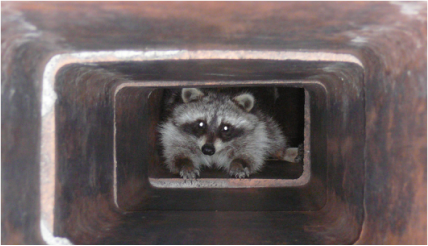 One of the most common den sites for urban raccoons is inside a chimney. An uncapped chimney looks like a perfect hollow tree to a pregnant raccoon. Raccoons have no problem climbing in and out of the chimney flue, and the smoke shelf provides exactly the right size platform for giving birth. Inspecting your chimney cap to make sure it is secure is the best way to avoid playing host to a rowdy family of raccoons. That’s not the sound of the Easter Bunny hiding eggs. If you’re already hearing strange noises coming from your chimney or attic, contact a reputable wildlife control company for professional advice on the best way to humanely evict and permanently exclude the critters. About this Angie’s List Expert: Bonnie Bradshaw is a certified wildlife rehabilitate with 911 Wildlife, providing animal removal services in Dallas. Since 2006, 911 Wildlife has specialized in humane eviction of raccoons, opossums, squirrels, skunks, bats, snakes and other animals from residential homes. They are a recipient of the 2013 Angie’s List Super Service Award.